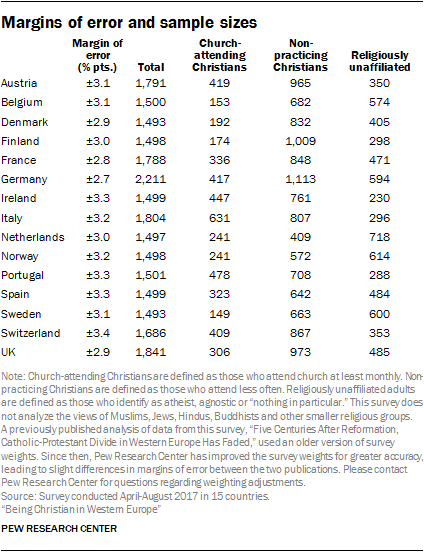 Pew Research Center conducted surveys among 24,599 adults (ages 18 and older) across 15 countries in Western Europe. Interviewing was carried out under the direction of GfK Belgium by telephone (both cellphones and landlines) from April to August 2017. The questionnaire administered by survey interviewers was designed by Pew Research Center staff in consultation with subject matter experts and advisers to the project. The wording of several questions was subjected to cognitive testing, and the full survey questionnaire was pretested in all countries prior to fieldwork. The surveys are nationally representative, with samples of about 1,500 or more respondents in each country, allowing researchers to analyze the opinions of respondents by age, gender, education and religious affiliation (Christian or religiously unaffiliated). A combination of landline and cellphone random-digit-dial samples was used. Respondents in the landline sample were randomly selected by asking for the adult who has the next birthday. Interviews in the cell sample were conducted with the person who answered the phone, if that person was an adult 18 years of age or older. The combined landline and cellphone sample are weighted using an iterative technique that matches age, gender, education and regional population distributions to parameters from the latest census data available for the adult population in each country. In the absence of census data, large government surveys were used as benchmarks. The weighting procedure accounts for the fact that respondents who have both a landline and a cellphone have a greater probability of being included in the combined sample and adjusts for household size among respondents with a landline phone. The margins of error reported and statistical tests of significance are adjusted to account for the survey’s design effect, a measure of how much efficiency is lost from the weighting procedures. More details about the project’s methodology, including country-specific sample designs for this study, are available here. General information on international survey research at Pew Research Center is available here. 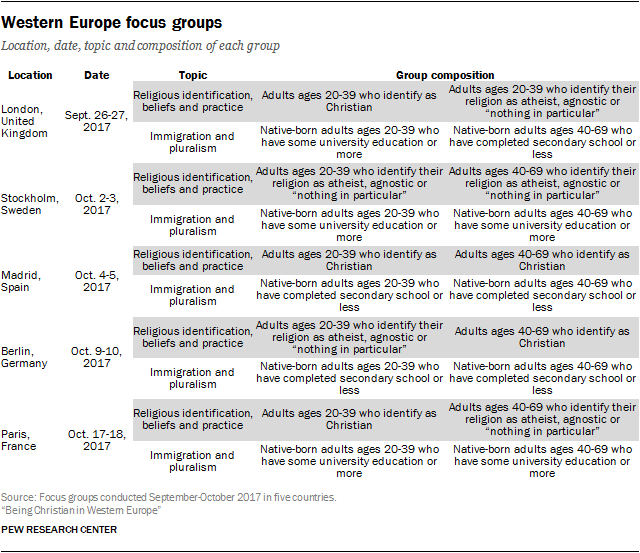 In addition to the multi-country survey, Pew Research Center commissioned Ipsos MORI to conduct a series of focus groups in five Western European countries. Each focus group consisted of eight adults coming together for approximately two hours for a discussion led by a professional moderator. Participants were recruited, by telephone, from a variety of sources: re-contact questions at the end of pre-existing surveys, purchased sample lists and people who have opted in to be on vendor recruitment lists. Potential participants were asked questions on topics such as their religious identification, religious practices, views on diversity and social circles, and then were chosen so that each focus group included a broad mix of backgrounds and opinions. People who work in journalism, public relations or market research and those who have participated in a prior market research study in the last year were excluded from recruitment. Within each group’s selected demographic composition, participants were balanced in terms of gender, age and education. In each group, no more than two people were economically inactive – that is, they were unemployed, students or retired. Four focus groups were conducted in each location, with two focus groups on topics related to immigration and pluralism and two focus groups on topics related to religious identification, beliefs and practices. The countries were selected for their geographic diversity as well as their varied experiences with immigrants and refugees. The discussion in each group lasted approximately two hours. All participants were offered a financial incentive for participation and to cover out-of-pocket expenses. Participation in the focus groups was voluntary. Complying with ICC/ESOMAR Code of Conduct and all applicable local laws, all information gathered from adults who took part in the focus groups was anonymized so it is not possible to identify them. During the recruitment stage and in advance of the groups, each participant voluntarily confirmed his or her willingness to take part in a focus group project, after having been informed of all aspects of the research that are relevant to their decision to participate. This included the general topics of discussion, the companies involved in the research, the confidentiality of participants’ information and identities, how any data they provide will be used, and explicit notification that their answers would be recorded and transcribed for research purposes. All participants were reassured prior to the groups that they could withdraw from the research process at any time without penalty or loss of the incentive payment.